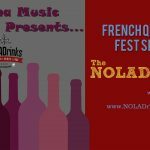 On this week’s The NOLADrinks Show with Bryan Dias, we’re on the cusp of French Quarter Fest! 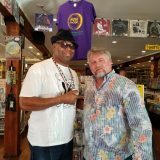 We come from Louisiana Music Factory with another edition of our French Quarter Fest Series with the marvelous John Boutté and Paul Sanchez. 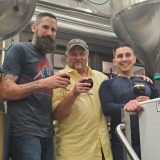 Pictured above from left – Paul Sanchez, Bryan Dias of The NOLADrinks Show, and John Boutté at Louisiana Music Factory. 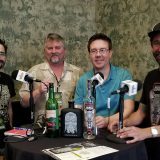 We start things off with a little housekeeping letting you know about this week’s show as well as next week’s – a great chat about vintage cocktail books with three cocktail history luminaries – Jeff “Beachbum” Barry, Greg Boehm, and Jim Meehan. 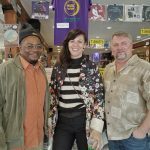 Then, we’re over at our favorite record store on the planet, Louisiana Music Factory, for another installment of our French Quarter Fest Series! The fest is this week and we couldn’t be more excited! 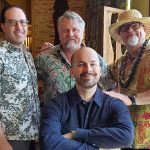 To that end, we have a great one for you – we talk with John Boutté and Paul Sanchez! It’s a terrific and, often, funny chat that covers a lot of ground. 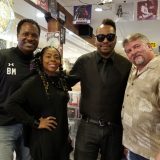 We talk about their respective upbringings growing up in New Orleans and we learn about their musical backgrounds. They both grew up in big families and were surrounded by music. John and Paul share some of their early gigs and collaborations. We then, as we always do on this series, move into a chat about food and drink. Growing up in sizable families meant they both knew their way around the kitchen and had moms that made it all happen with feeding a big family. We even touch on Chartreuse and barbecued rabbit! 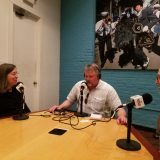 The next segment features a chat about French Quarter Fest and what it means to them to participate in this special event. They let us know when and where they are playing at the event and a bit on what to expect from their performances. 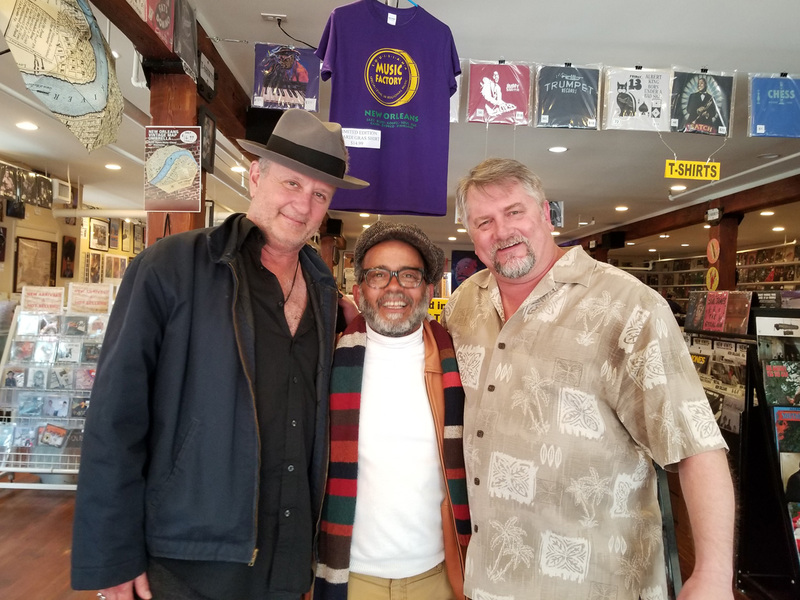 Pictured at left from left – Paul Sanchez, John Boutté, and Bryan Dias of The NOLADrinks Show at Louisiana Music Factory. 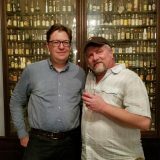 We continue with our podcast-only portion of the show – “Another Shot with NOLADrinks.” Among other things, John and Paul talk about their collaborations and share some stories on the writing of some of their famous tunes! You’ve probably never heard these stories before – don’t miss it! 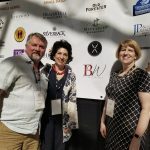 We close things out with our “Parting Shot” with some thoughts on enjoying French Quarter Festival. See you out there! 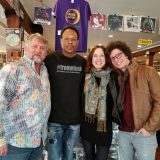 The map below shows the location of Louisiana Music Factory where you can find all of our guests’ music in the store or online. 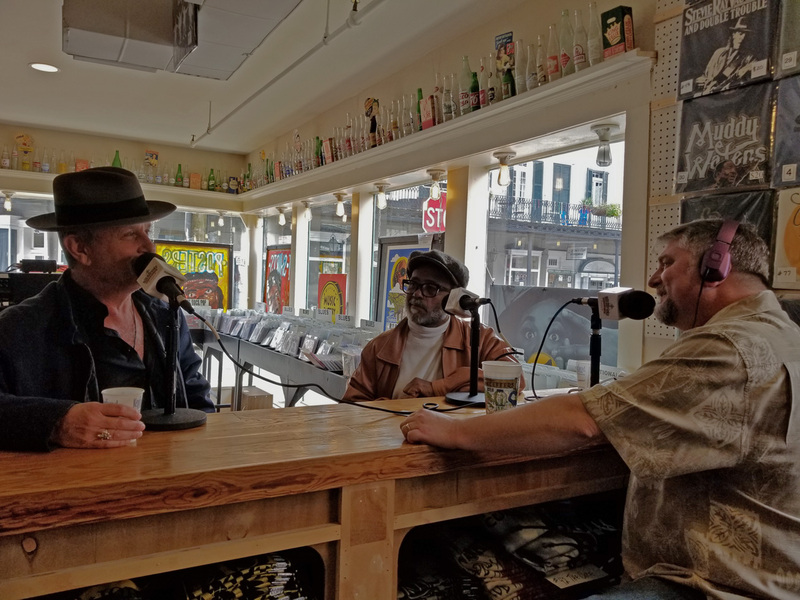 You can stream, download, and subscribe to The NOLADrinks Show podcast using the links and player at the top of the post.